A rare pair of Bow Porcelain Candlesticks, modelled as siting Stag and Hind, surrounded by floral bocage, painted in coloured enamels, on raised scroll moulded rococo base, c.1760. Dimensions: 23 cm. high. Condition: Some restoration. Unmarked. 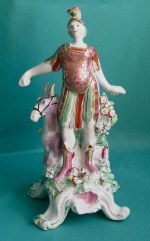 The figure is dressed in Roman costume, standing with outstretched arms in front of a horse, on rococo scroll base, painted in coloured enamels picked out in gilt. Dimensions:21.8 cm. high. Marks: painted in red. Condition: small chips and minor restoration. 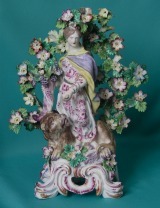 A Bow figure of "Ceres", allegorical of Earth from the Four Elements, standing holding a cornucopia, a lion at her feet, wearing hand-painted floral gown in front of flowering bocage on raised rococo scroll base. Dimensions: 27 cm. hight, 22 cm. wight. Condition: firing cracks, one arm re-stuck, some damage to bocage. 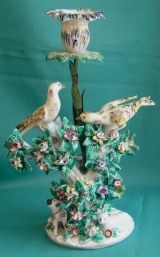 A Bow porcelain candlestick "Birds in Branches", c.1762-65, modelled as a pair of nesting buntings perched in the branches of a tree, their nest containing three chicks, the branches applied with leaves and brightly coloured flowers, the candle nozzle supported on a "tole peinte" stem. Dimensions: 27 cm. high. Unmarked. Condition: minor restoration and chips on the flowers. 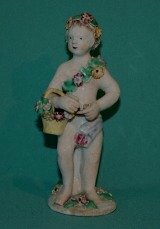 A rare English Porcelain Figure, (possibly Bow*), modelled as a putto, holding a basket with flowers, painted with coloured enamels, c.1765. Dimensions: 13 cm high. Condition: a firing crack on the base, small chips on the flowers. Unmarked. *This figure belongs to a group called "Bo-Lo" ( Lowestoft type) and often attributed to Lowestoft. It is illustrated in "The illustrated guide to Lowestoft Porcelain" by Geoffrey A. Godden 1969, page 29, plate 142.